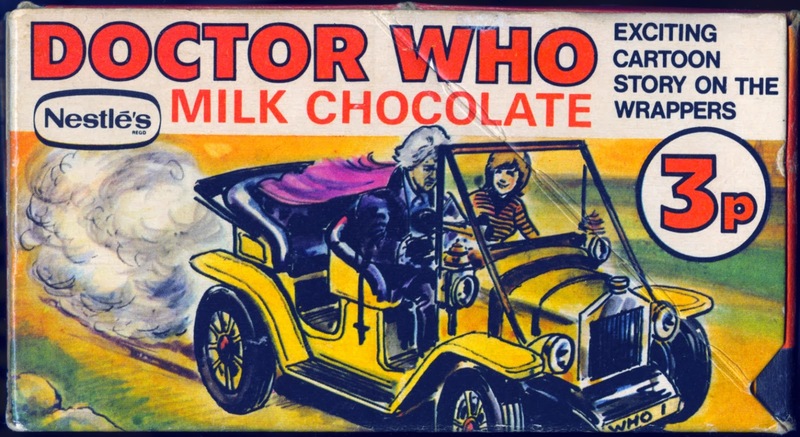 Today it’s picture eleven of Doctor Who Fights Masterplan “Q” - the 15-part adventure on the backs of the Nestlé Doctor Who Milk Chocolate bars. En route to find authorities to help them, The Doctor and Jo realise they are being pursued by a lumbering beast. Reaching to a button on Bessie’s dashboard, The Doctor has a plan. number plate, MTR 5 would be switched to WHO 1 when filming. The owner didn’t like his number plate appearing on the packaging, but the BBC said nothing could be done to change it. Here is a slightly different version of the box side, with the Doctor Who logo stacked horizontally.